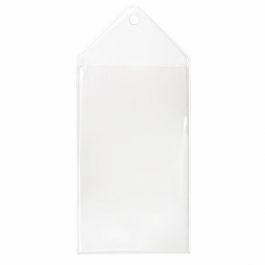 HBM5 is our Hanging Vinyl Bookmark Sleeve that measures 1 13/16" x 5 11/16" and is ideal for more slender bookmarks, photos, and artwork. A round hole is located at the top to hang from a standard peg display or to dress up with your favorite ribbons or tassels. 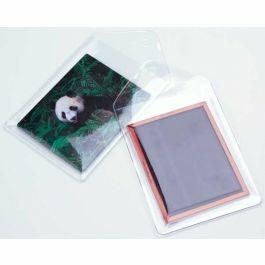 This sturdy plastic vinyl is 7.5 mil thick and protects your creations from dust and handling. Acid-free. 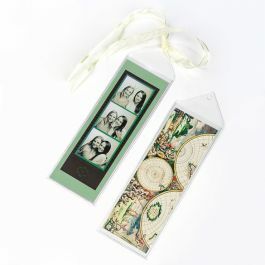 Hanging Vinyl Bookmark Sleeves offer an easy way to display inspired creations. HBM5 is our 1 13/16" x 5 11/16" vinyl sleeve and holds bookmarks, artwork, drawings, and photo strips. This sleeve features a hole at the top that is used for a standard peg display or to attach ribbons/tassels. The vinyl is made from a durable 7.5 mil plastic that won't rip or tear with frequent use, providing long-lasting protection for treasured creations. 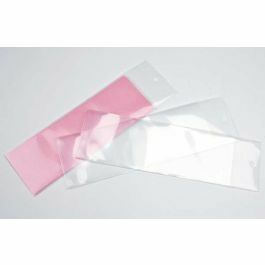 This protective sleeve eliminates the need for laminating your creations while keeping the original quality intact. 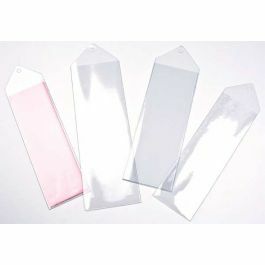 Outer Dimensions: 1 13/16" x 5 11/16"
The primary use for HBM5 is to hold bookmarks that fit up to 1 13/16" x 5 11/16"
Shipped in sheets that contain five bookmark sleeves. For optimal longevity of vinyl material, it is recommended that this product is stored at room temperature. Extreme hot or cold environments may affect the quality of this product.